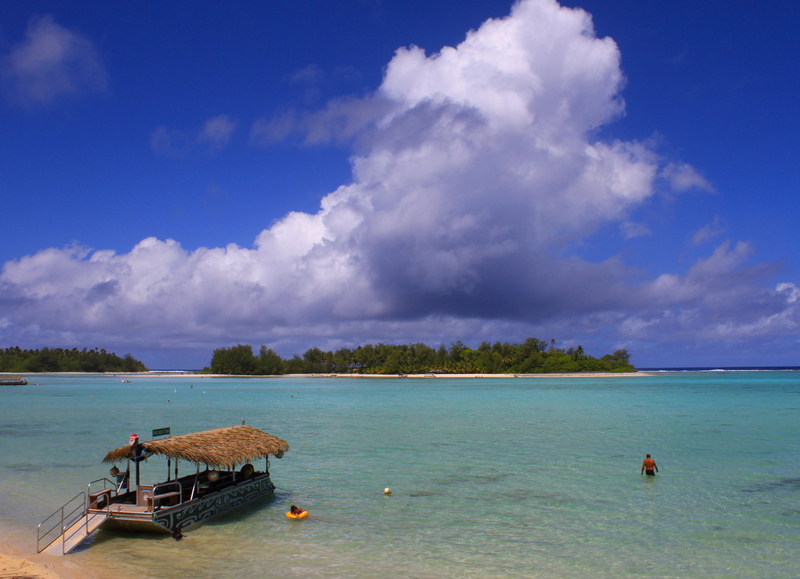 Encompassing an area the size of western Europe, the Cook Islands are home to about 15,000 Maoris, mostly on Rarotonga, and about 100,000 tourists per year, mainly from Australia and New Zealand, which ruled the former British colony from 1901 until independence and free association in 1965. From Tokyo, it seems like the other end of the world: an 11-hour flight south to New Zealand, and a four-hour flight east to Rarotonga. During my three-week visit in January, I saw only one Japanese traveler, two Chinese, a handful of Canadians and Americans, and some intrepid Europeans who were studying or traveling in New Zealand. Many people I met are asking: Where are the Japanese tourists? This nation has so much to offer them. It’s safer than Guam or Saipan. The Cooks, though expensive, are more affordable than Tahiti, which has a reputation among Japanese of being a dream destination, but too distant and expensive. Japanese would love Rarotonga’s Saturday morning market, teeming with sarongs, ukuleles, pearls, masks, and handwoven hats and mats. Japanese, who often want to marry in Christian churches overseas, will find many resorts with staff in charge of arranging and executing wedding ceremonies in the traditional Maori way. 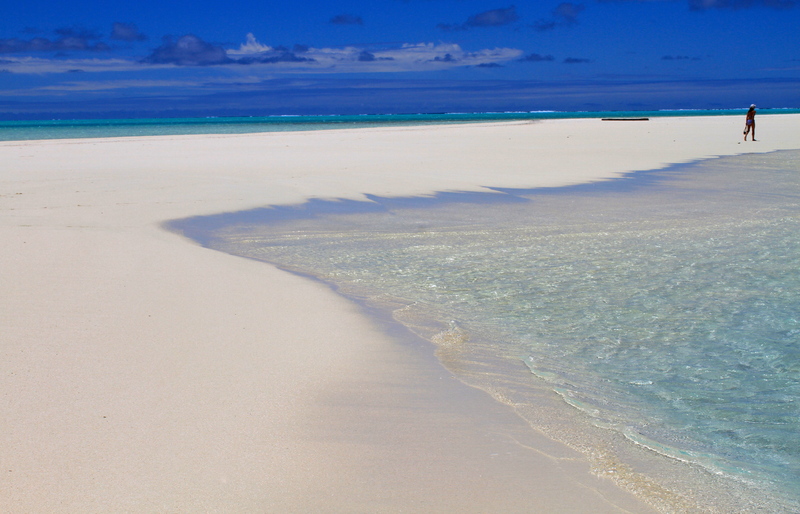 The atoll of Aitutaki, a 40-minute flight from Rarotonga, has perhaps the most beautiful lagoon in the Pacific; one of its most reputable resorts, the Pacific Aitutaki; and fantastic lagoon cruises, such as with Teking Tours, to spectacular reefs and uninhabited islands caked with creamy white sand. 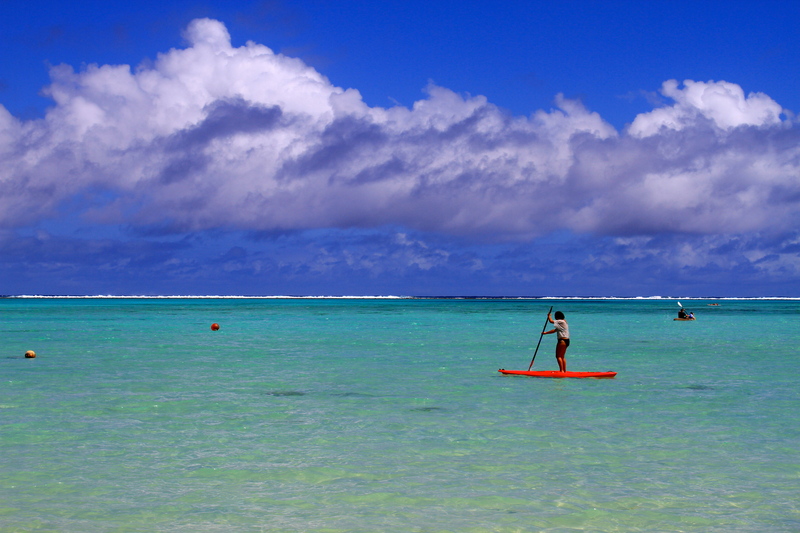 The main island, Rarotonga, a volcano rising 4500 meters from the ocean floor, has the cooling breezes of Hawaii, spectacular scenery rivaling Bora Bora in Tahiti, and a technicolor lagoon reminiscent of Guam or the Marshall Islands. It’s the Garden of Eden. Coconuts fall from trees into your hands (or onto your head if you’re not careful), and nearly every yard seems to bear a cornucopia of avocados, papayas, mangos, breadfruit, pineapples, starfruit and passionfruit. But thanks to the strength of the New Zealand dollar, which is the local currency, the Cooks are quite expensive: $6 for a loaf of bread, $7 for a box of crackers and $8 for Pringles. Even the cheapest fast-food eateries offer greasy hamburgers for $5 or fish and chips for $10, while entrees at many restaurants go for $20 and up, partly because of price gouging and the cost of importing food from New Zealand or even Indonesia. Rarotonga generally feels like the old-time South Pacific, with women wearing flowers in their hair, and big-boned guys sporting tattoos. Instead of tight security at the airport, a ukulele player greets arriving air passengers with song. Sometimes, however, Rarotonga feels like “Mexico for Kiwis” or Fort Lauderdale: a place for rugby-loving Kiwi youth to get drunk on the Pub Crawl truck circling the island, then at Whatever Bar or Rehab, where adventurous foreign women have a choice of local boys to spoil them. For many Kiwi families, it’s like Hawaii Down Under, replete with cheesy lagoon cruises by day and cultural performances at night featuring muscular natives in feathery head-dresses and sweaty young maidens wearing coconut bras. 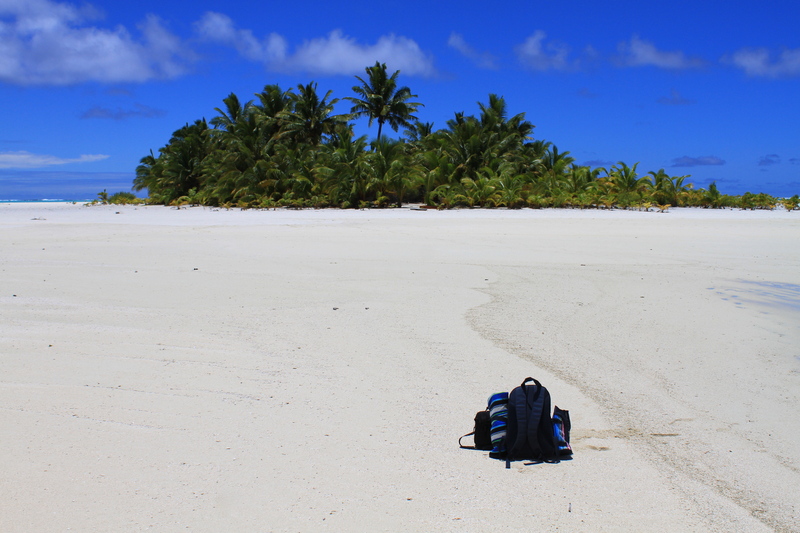 A seasoned traveler can’t help asking: if it’s really a paradise, then why are roughly 85,000 Cook Islanders living in New Zealand and Australia? The answer is complex. One high school grad, selling carvings at the open air Saturday market, said she was desperate to get away from a future of minimum wage hotel jobs — paying $6.50 an hour — and the boredom of an island, 32-km in diameter, where everybody knows everybody. A 50-something butcher, who blasted blues guitars riffs at his neighbors, said he’s worth more in Australia, and besides, he can’t stand his own music and culture, which remains centered around Christian churches with devout followings of worshippers singing glorious multi-party harmonies on Sundays. 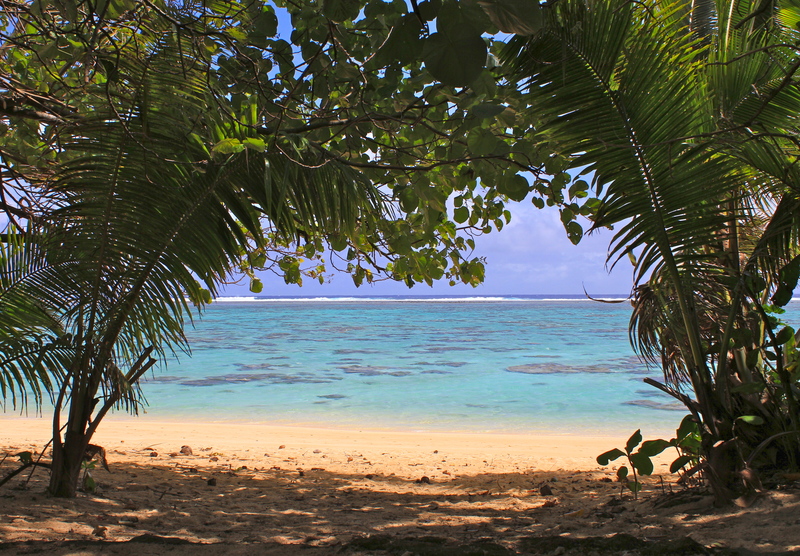 Since Cook Islanders have New Zealand citizenship, they’re naturally drawn to higher wages and education, and the diversity of Auckland or Melbourne. Besides, the Maoris have a proud tradition of migrating across the ocean, and just because they work in Brisbane or Sydney makes them no less proud of their rich heritage and sacred traditions, best displayed at the Highland Paradise cultural feasts on Rarotonga. 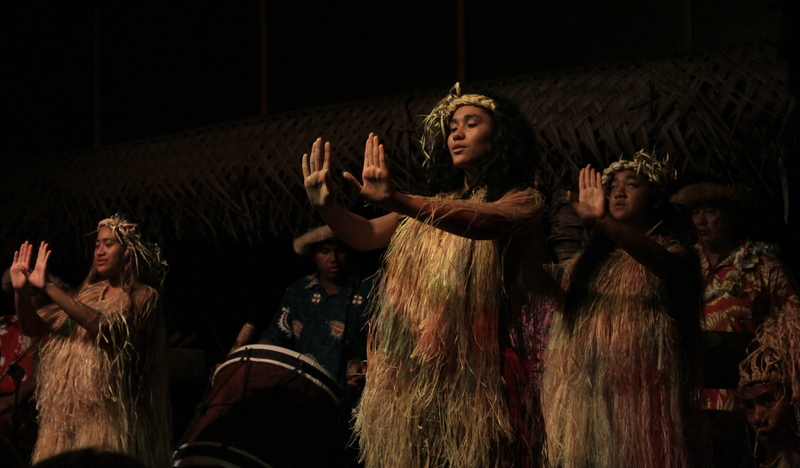 Many hope that a developing tourism industry will induce more Maoris to stay closer to home. European backpackers, who have blazed trails across Asia, are starting to discover the Cooks. 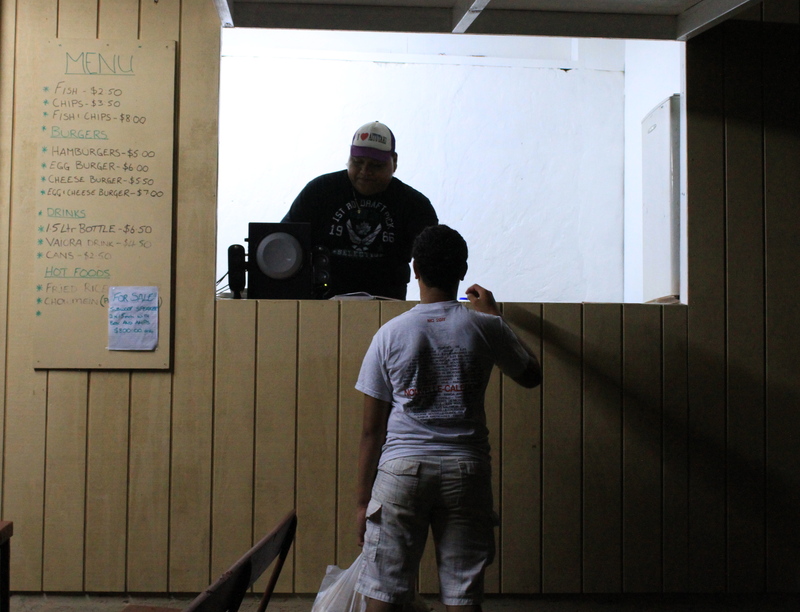 They find dorm rooms for 25 dollars or singles for 50 at Vara’s, Aremango, Rarotonga Backpackers or other places with communal kitchens where they cook up instant noodles or canned food. Two buses — one going Clockwise, the other Anti-Clockwise — are good deals at $4 per ride or $25 for 10, and the drivers are fun-loving and courteous. 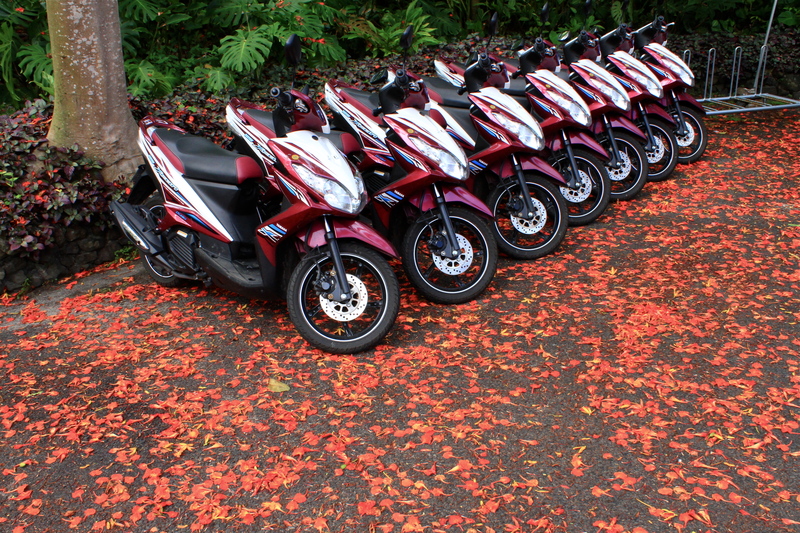 An over-supply of shops rent out Yamaha, Suzuki and other motorbikes for $30 per day or $100 per week, with similar or cheaper rates for mountain bikes or electric push-bikes. In paradise, the best things are often free. Stunning flame trees decorate the asphalt roads with red petals, while yellow and red hibiscus poke out of bushes and await their place in women’s hair. 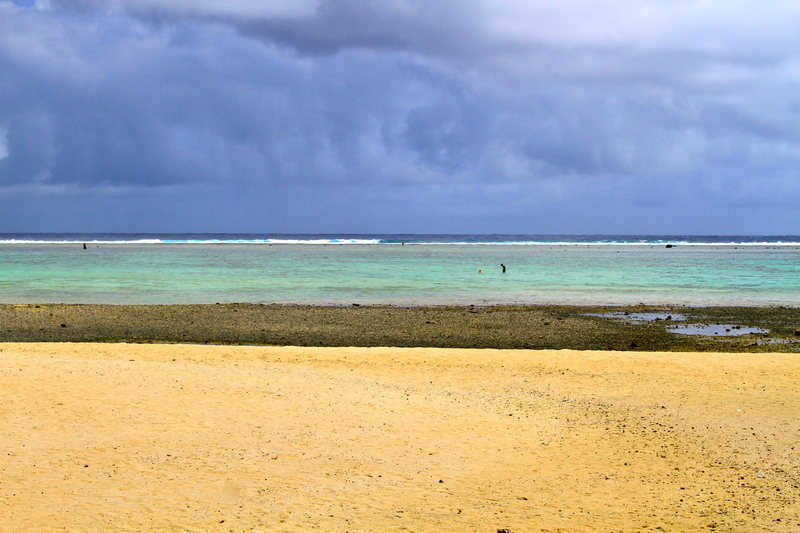 With your own snorkeling gear, you can lose your mind perusing the reefs near the Fruits of Rarotonga shop or the Dive Center near the Rarotongan Resort. You can stroll out of the cozy Pacific Resort on Muri Beach and kayak, swim or walk at low tide across the peppermint lagoon to your own little islet, known locally as a motu. You can hear fantastic local music everywhere: from the giant men and ladies with puffy fingers strumming ukuleles at the resorts, or the Tropical Sounds band at Hidie’s bar, a funky local hangout on Wednesday and Friday nights and a food court daily at noon. 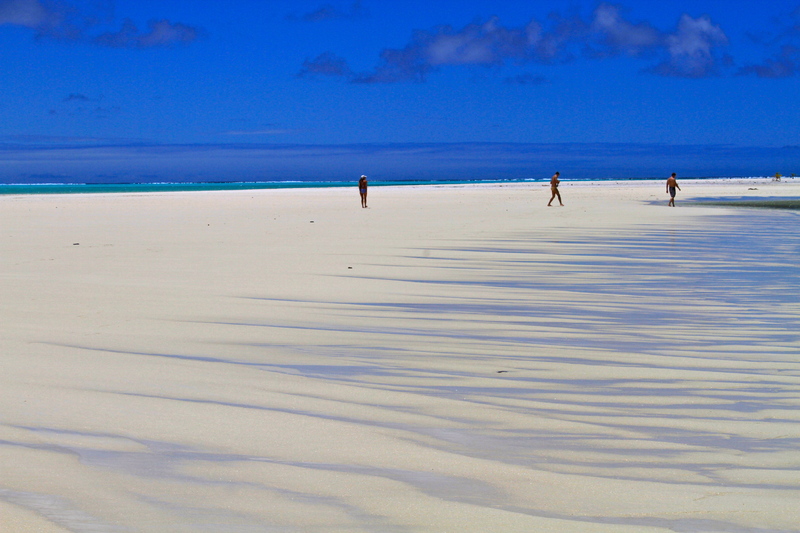 While there may be no such thing as a true paradise, travelers can find slices of it here. 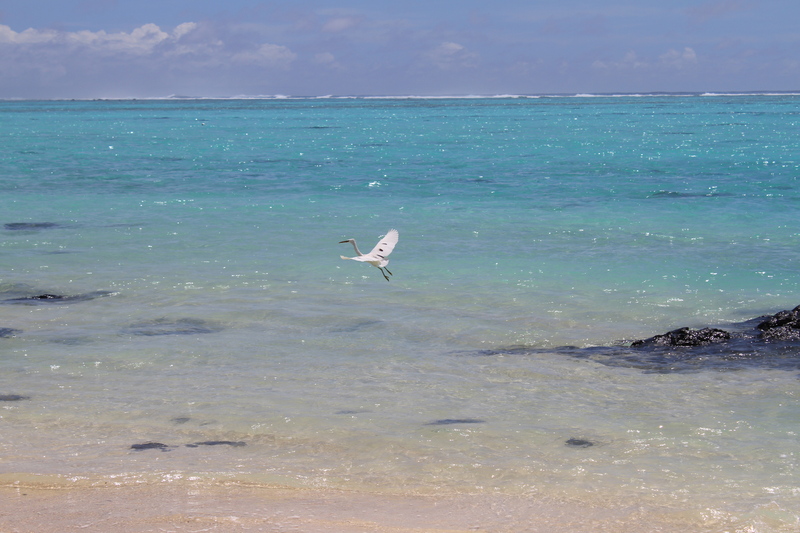 I found it snorkeling among a giant flounder, three moray eels, giant trevally and schools of other fish, who benefit from the traditional “Raui” prohibition on fishing in the lagoon. 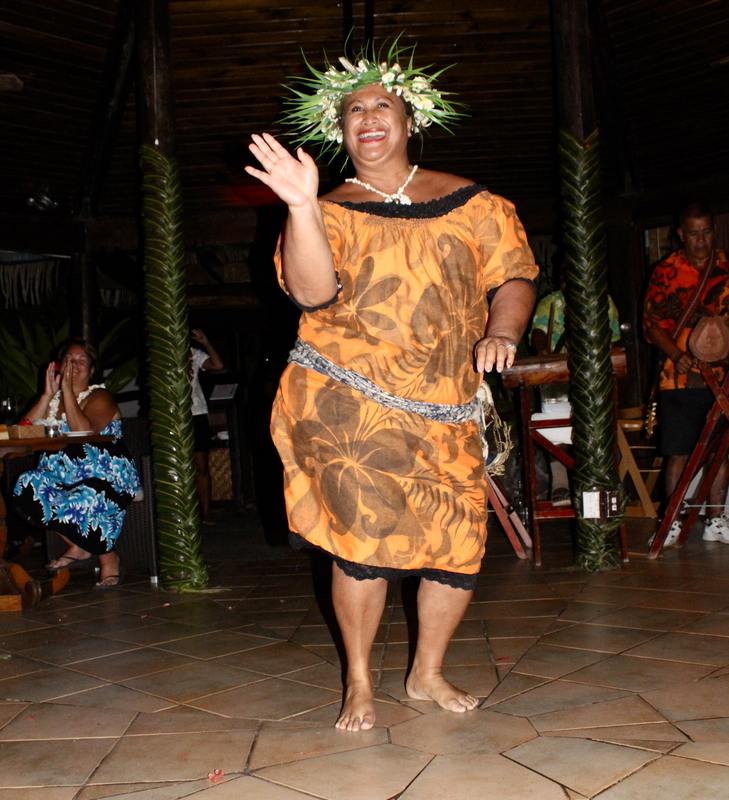 I found it at the “island nights” at Highland Paradise, Muri Beach Resort and the Pacific Resort, where the island’s champion dancers sway their hips to the frenetic rhythms of some impressive drummers. 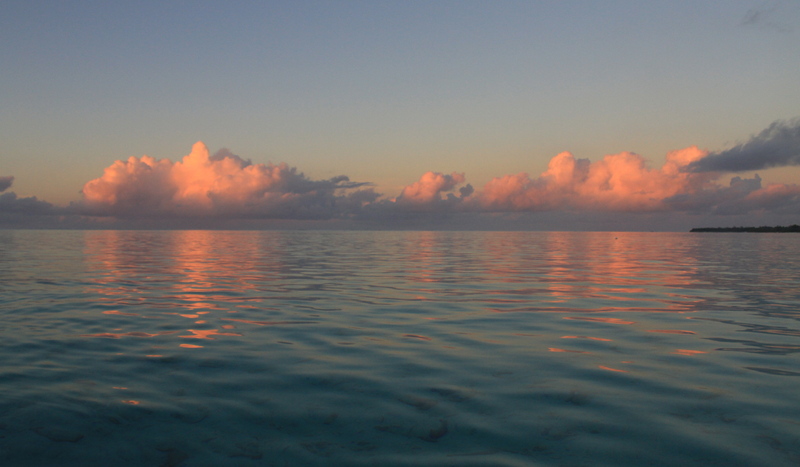 My personal paradise was playing basketball with athletic local guys at the Seventh Day Adventist church, and then rinsing off in the lagoon as the sunset painted the sky in the colors of the reef and fish below. Like Okinawa, the Cooks boast healthy seniors living well into their 80s and 90s. 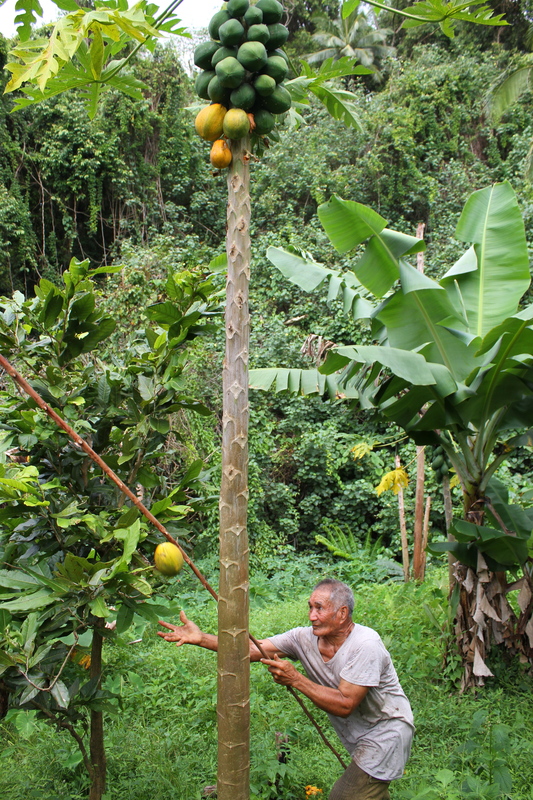 On his plantation high above the lagoon, Joseph Marsters, 85 years young, has a litany of stories to tell, while picking us papayas, bananas, and pineapples. 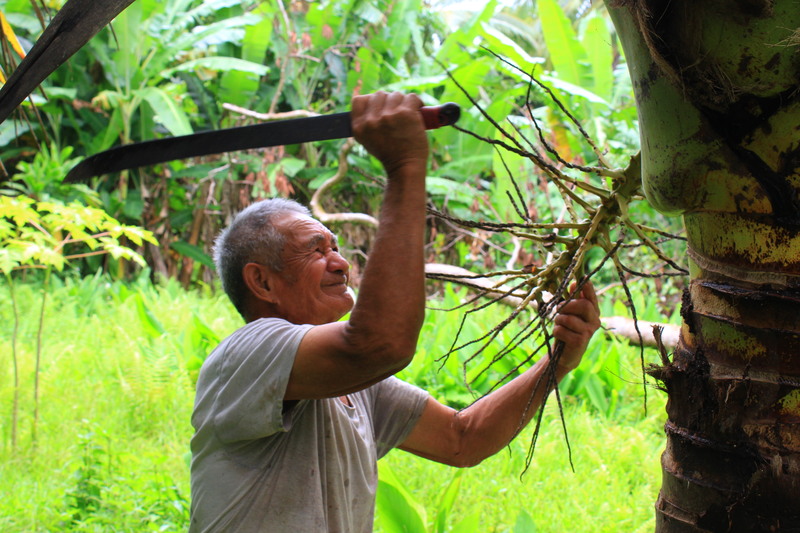 He cuts down a piece of sugar cane — also useful as a walking stick — and replants the leafy head into the ground to regenerate a new crop. He then shows us how to hack down and husk a coconut. After we drink the milk — with a dank and fermented taste similar to fine Japanese sake — he gives us bottles of homemade coconut oil for our sunburnt, sea-dried hair. As we sit in his little mountain hut overlooking the wild blue Pacific, where he used to face down his fears on rickety boats for days on end, I can’t help but thinking: where are the Japanese tourists? This question lingers as I fly on Air Rarotonga to Aitutaki (about $200 each way), which is much safer than the hulking cargo boats that go every month or so and often end up delayed or grounded. 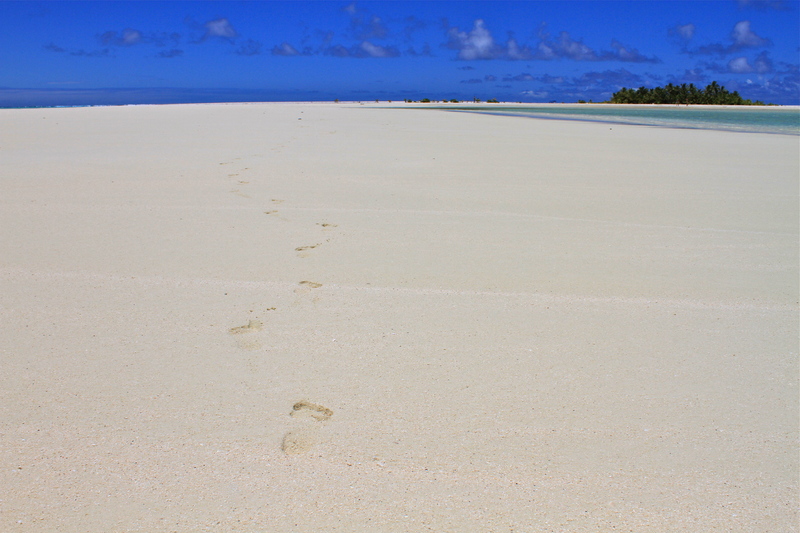 Even more than Rarotonga, Aitutaki is a step out of time. 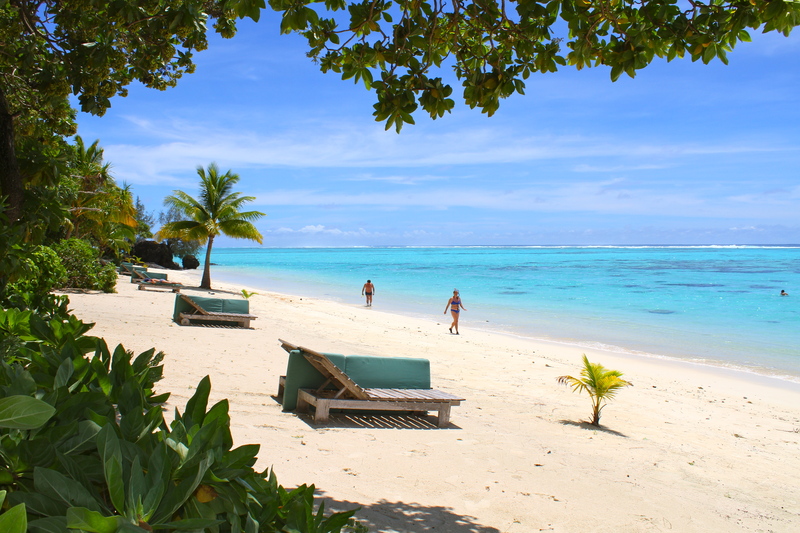 The Pacific Resort Aitutaki, like the other great resorts of the world, has a way of making you want to savor each moment instead of rushing through them. Not long after checking into my bungalow, I begin to lose my Tokyo stress and sink into the luxury of my bed, sofa, two hammocks and four beach loungers. Soon, I no longer care about the time or date. Time is no longer calibrated by a ticking clock organized into divisions of 24, 60 and 60. Here, time moves with the ebb and flow of the tides — two high and two low per day — and the rise and fall of the sun, moon and stars. In addition to the lagoon and the resort’s infinity pool and waterfall, I have five showers of my own: a beach front nozzle for rinsing, with a lower-level spout for my feet; a private outdoor garden shower with high walls for privacy and mirrors for intimacy; and an indoor shower room with two shower nozzles meant for honeymooners. In other countries, travelers explore temples or castles to absorb the local culture. In the South Pacific, one must study the hammock. Comforted by an invisible mother rocking me in the cradle, I sink deep into a state of relaxation not possible in a hard chair, and watch yellow hibiscus floating down from a tree. To further my cultural studies, I go snorkeling. 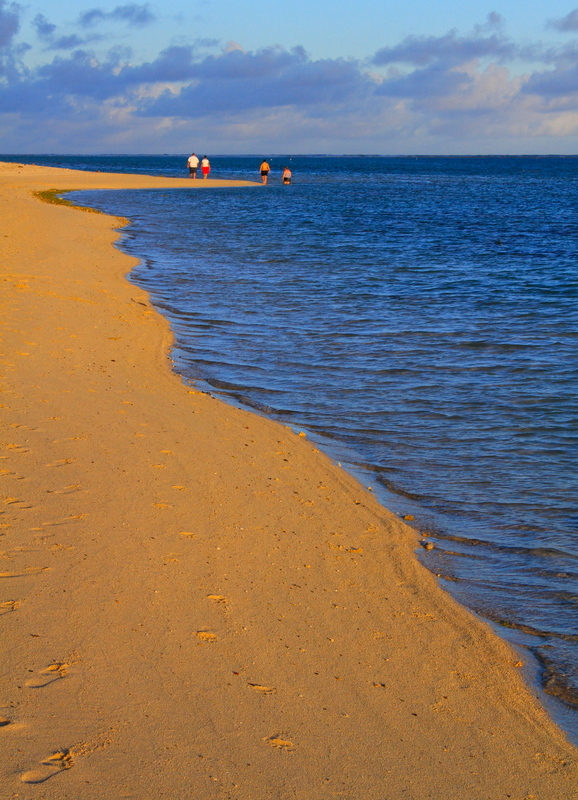 The lagoon is just the right size: big enough for a challenge, yet shallow enough to safely touch bottom. The vigorous currents do much of the swimming for me, ferrying me like an astronaut over clusters of coral as I follow the resort’s Aquatic Eco-Trail map through different reef zones of fish. Tripping from the endorphin rush, I doze in the hammock and awake in a daze. 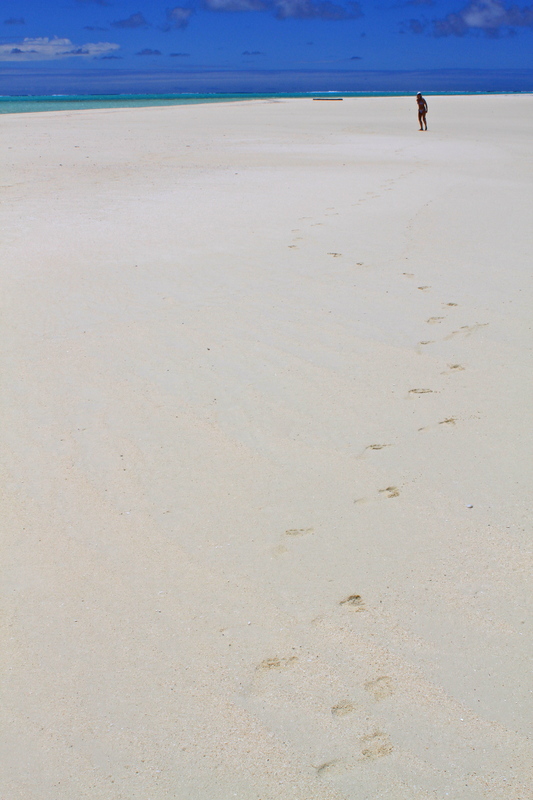 Putting my feet on powdery white sand feels like my first moment on Earth. 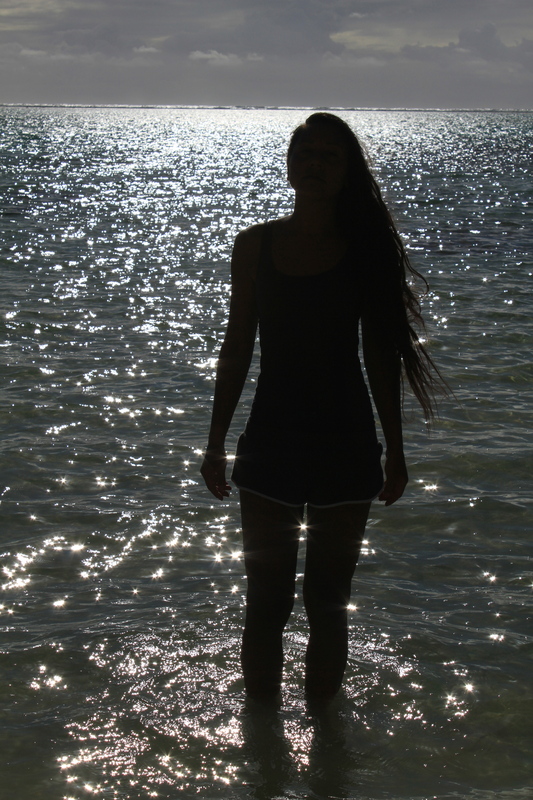 In the middle of the great blue ocean, far from civilization, I am at this moment a flower blooming under the sun. A flock of white birds play high in the sky, highlighting the absence of planes overhead in this remote part of the Pacific, far beyond the crowded skies of America, Europe and Asia. 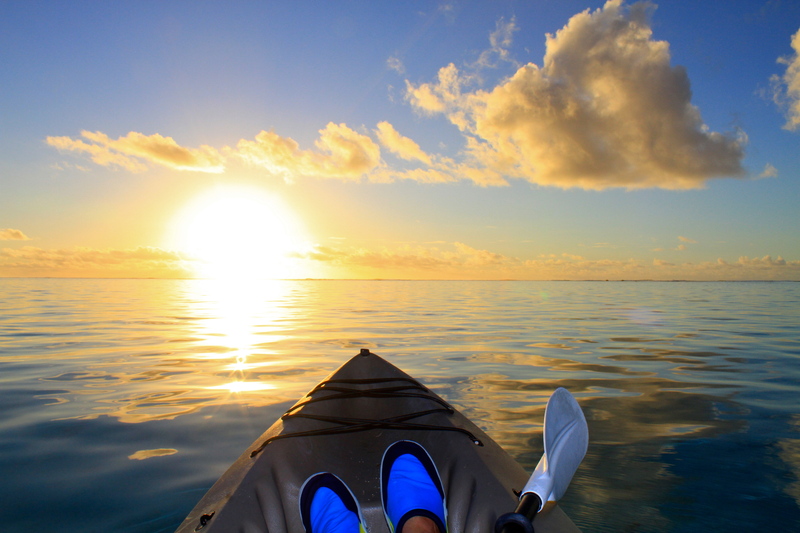 Refreshed, I hop into a kayak, with my camera wrapped in a towel, and paddle toward the late afternoon sun searing the blue sky to the west of the lagoon. Just then, what seems like a large bird flaps its wings directly in front of me. 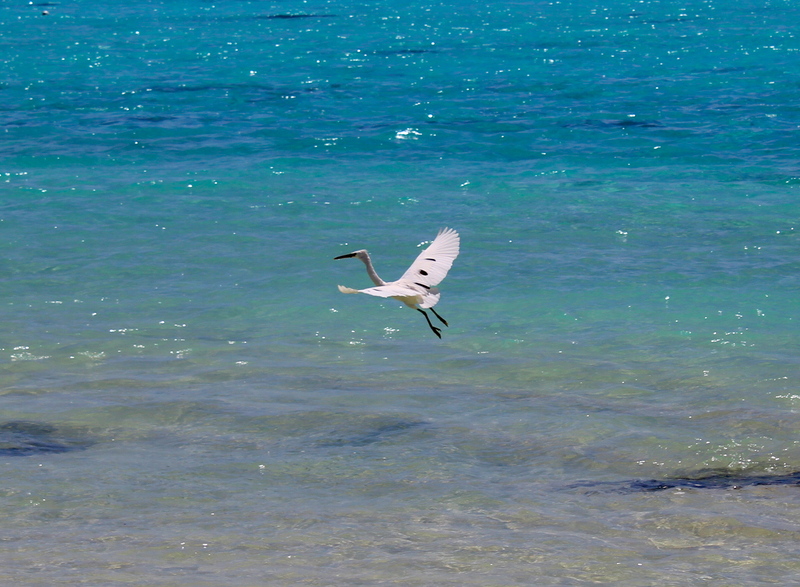 But this bird is under the surface of the water — a spotted eagle ray. It takes my breath away with it, as it glides majestically before me, seemingly wearing a royal purple robe studded with diamonds. 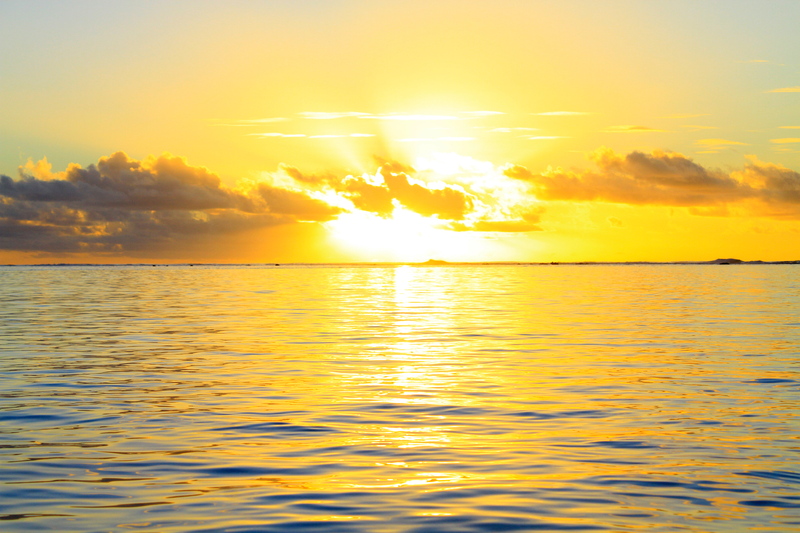 The sunsets here are a work of art, evoking images of South Pacific painters Paul Gaugin and William Hodges. Clouds turn from white to pink and reflect on the mirror of the glassy lagoon. With nothing but water between my kayak and the sun, I feel as if I am somehow in the middle of the sunset, bathing in a fountain of molten gold. After the sun plunges into the sea, bands of green — yes green — emerge above the horizon, while clouds seem to parade like poodles at a dog show. Instead of hurrying ashore, I watch the stars pop out one by one until I’m paddling home in a three-dimensional planetarium of darkness and starlight. After a scrumptious meal of ika mata raw tuna and blended fruit juices, I stroll back to my bungalow thinking I’ll go to bed early after reading a book about the Cook Islands by Ewan Smith, a gifted New Zealand-born photographer and pilot who also runs Air Rarotonga. However, the moon calls me to kayak on the lagoon at midnight. 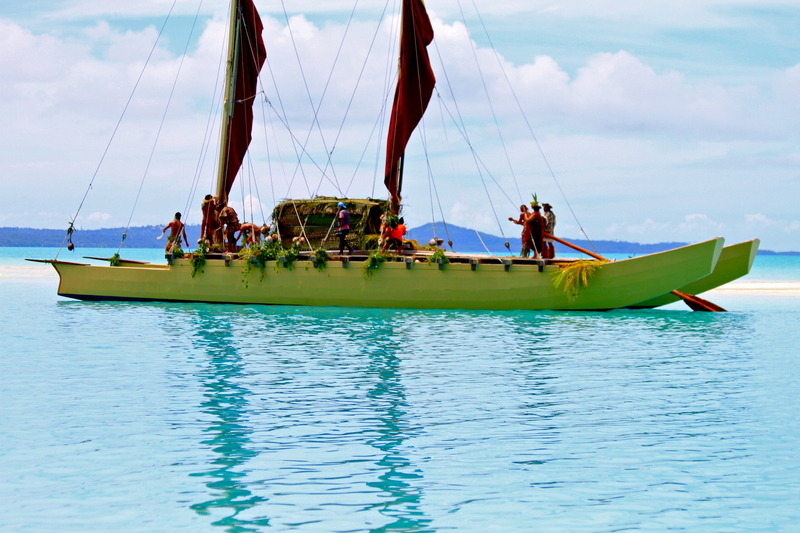 Laying on my back, gliding over the calm water, I think of the ancient seafarers, crossing the South Seas in traditional vaka outrigger canoes, navigating by the celestial map of the moon and the stars, and the patterns of waves, winds and birds. Like a man unable to read a map, I recognize almost nothing in the sky other than the Milky Way and the Southern Cross, which has spiritual appeal for someone from the northern hemisphere. 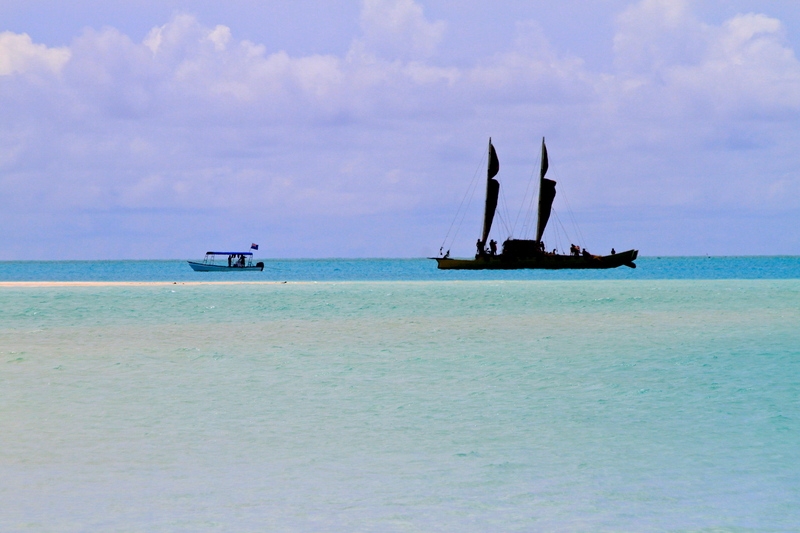 In these waters, the Captain James Cook charted much of the Pacific before being killed in the Sandwich Islands (i.e. Hawaii). Fletcher Christian and his crew staged their Mutiny on the Bounty near Tahiti and lived out secretive lives of hardship and solitude on Pitcairn Island (and we think Japan is isolated). On nearby Palmerston Island, an Englishman married several Maoris and populated the Pacific with offspring named Marsters. To the north, the Cleveland-born writer Robert Dean Frisbee began a new life among the amorous women of Puka Puka, while legendary Kiwi hermit Tom Neale spent 15 years in total isolation on Suwarrow. But the most amazing stories are those of the Maori seafarers, voyaging across the “Maori triangle” between New Zealand, Hawaii and Rapa Nui in the Easter Islands. Staring at the stars, I marvel at their achievements. They had almost no margin of error. One miscalculation, or lapse in judgement, and the ancient mariner would be thrown off course, adrift at sea forever. But for me, I have a lighthouse in the distance — a lamp in my bungalow. It leads me home to the Pacific Resort, where I sit on my hammock, breathing the cool night air, free from stress, and wondering where all the Japanese tourists are. 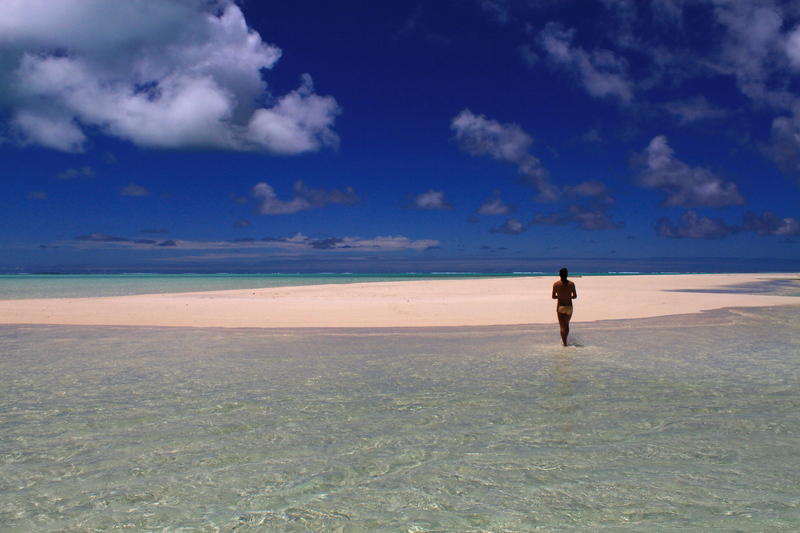 A woman from western Japan, who calls herself “Amy”, couldn’t find paradise in Thailand, Cuba, Brazil or French Polynesia. 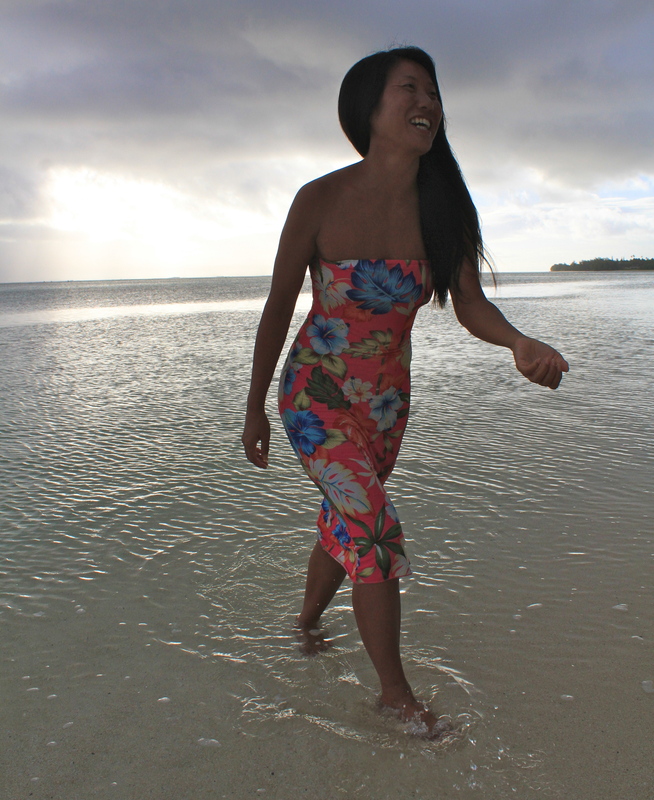 With the last of her savings, she bought a one-way ticket (about $300) from Tahiti to Rarotonga, the capital of the Cook Islands, a group of 15 South Pacific islands and atolls spread out over an area the size of western Europe. Claiming to have no money, she walked from the airport to the police station and asked them to shelter her. A jolly female officer, who had studied in Kyushu, gave Amy room on her floor, and then sent her to stay with a doctor near the trailhead for the island’s volcanic peak known as “The Needle”. Unable to afford even a $4 fare on a local bus, Amy hitchhiked around the island in sandals and a floral dress which accentuated her deep tan and Pacific beauty. When I met her on a sunny afternoon, she was carrying only an envelope, containing her passport and a certificate from a “school of Thai massage” in Chiang Mai. After buying her food and motorbiking her around the 32-km long island ring road, I dropped her off at the police station. At around midnight, uniformed officers took us for a “sight-seeing cruise” in their brawny Japanese truck, stopping to question local youth suspected of stealing motorcycles or driving drunk. “I’m going to stay with the police. Thank you for helping me,” Amy said, before bidding goodbye in Thai, Spanish, Portuguese and Maori. After that, I didn’t see Amy for several days. 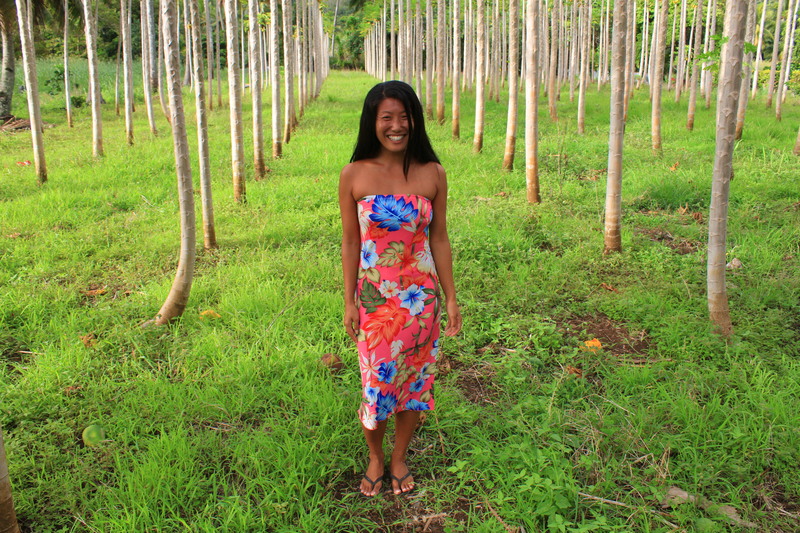 My contacts in the island’s network of 200 Filipino contract laborers said they didn’t see her working anywhere, and besides, she didn’t have a work permit or job contract waiting for her, which foreigners must have to work legally in the Cook Islands. Police officers also didn’t know where she was. Since Japanese women are often targets for thieves or kidnappers overseas, I was thinking of filing a missing persons report with Japanese authorities in Tokyo, since there’s no consulate in Rarotonga. But then, walking by the row of expensive restaurants on Muri Beach, I saw her with a wine glass in hand, drinking from an expensive bottle of New Zealand Pinot Noir with a giant Maori guy made of muscles and tattoos. Restaurant staff later told me that he “was taking care of her at his place in the mountains.” After that, I didn’t see her again. The Cook Islands government, and progressive managers of hotel groups such as the Pacific Resort, are actively trying to attract Japanese, especially honeymooners, to the safety and comfort of the Cooks. 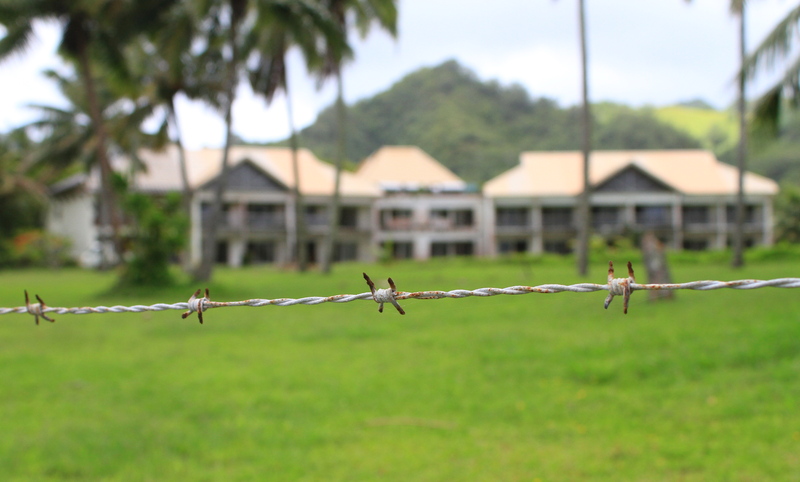 Moreover, Japan is a key player in the Rarotonga leadership’s attempt to utilize 100 percent green energy (mainly solar and wind) by 2020, an ambitious paradigm shift for any nation. 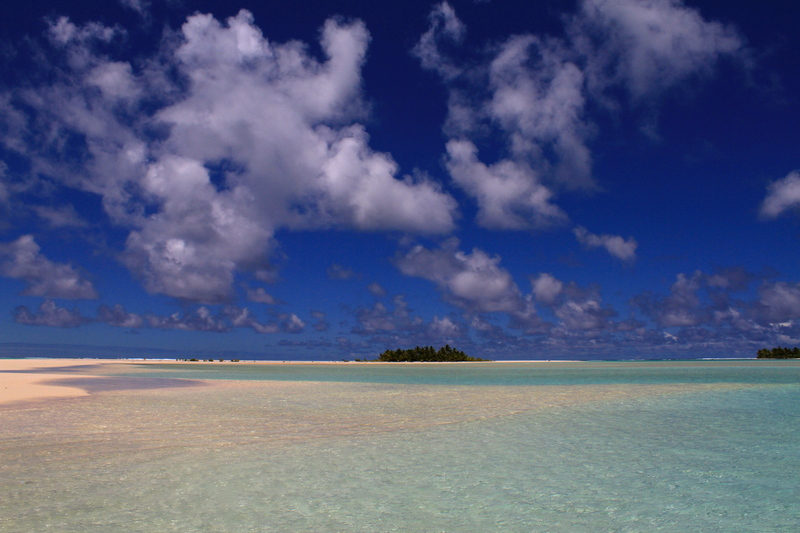 Cook Island government sources say Japan’s has committed $4 million USD to the project through the PEC (Pacific Environment Community) Fund, and Japanese firms are expected to bid for the right to supply hardware such as solar panels to remote northern atolls with plenty of sunshine. “It’s important we practice what we preach including addressing the harmful effects on our environment, it’s important we get on and do it, do something about it,” Prime Minister Henry Puna told reporters last year. 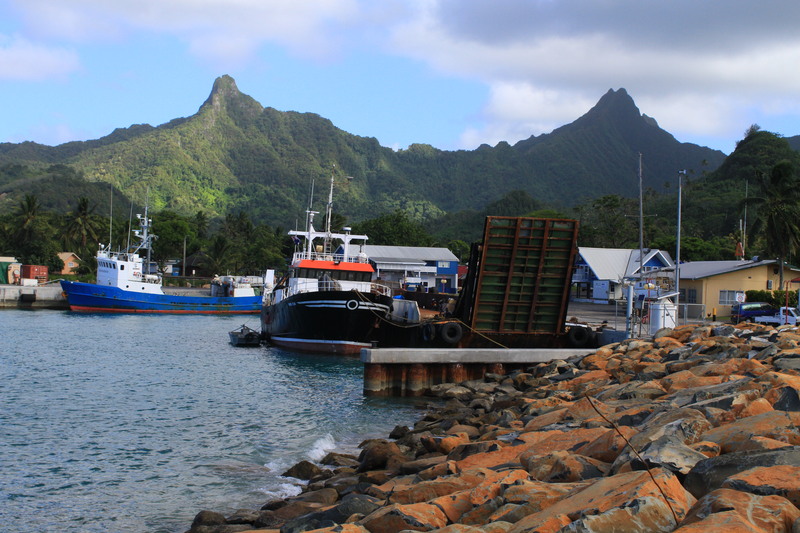 Roger de Bray, named Energy Commissioner in August, says the leadership expects to have solar power with storage up and running by year’s end in four of the remote northern island groups, which can be three hour flights ($1000 or more) from Rarotonga. 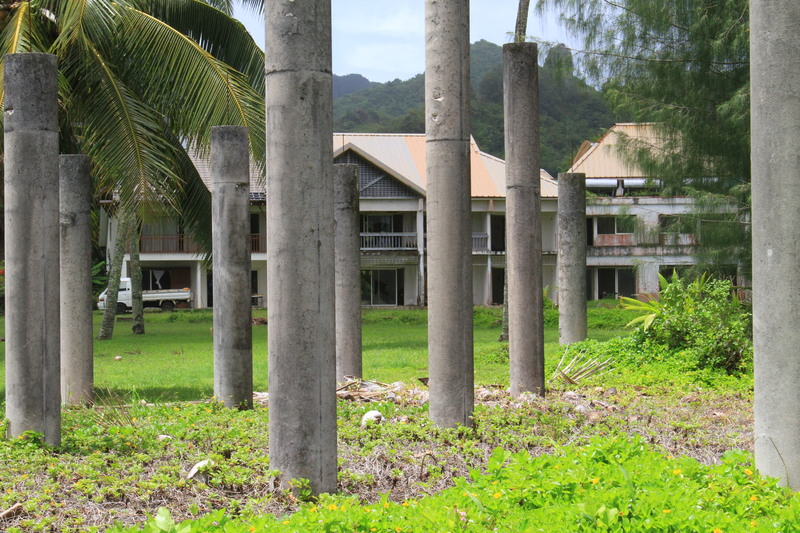 As a long-serving former chief of Top Energy, a utility in northern New Zealand, he knows it’s a big task to go from 3 percent usage of renewables on Rarotonga to 100 percent in seven years. But he points to new installations: a “thumping good” photo-voltaic unit atop a supermarket; 25 kilowatts worth of panels on an education building, and another 10 kilowatts of solar power generation on the Prime Minister’s office roof. He says the private sector of hotels and households are already leading the way, with solar powered heaters atop roofs to provide hot showers and cut down on power bills. 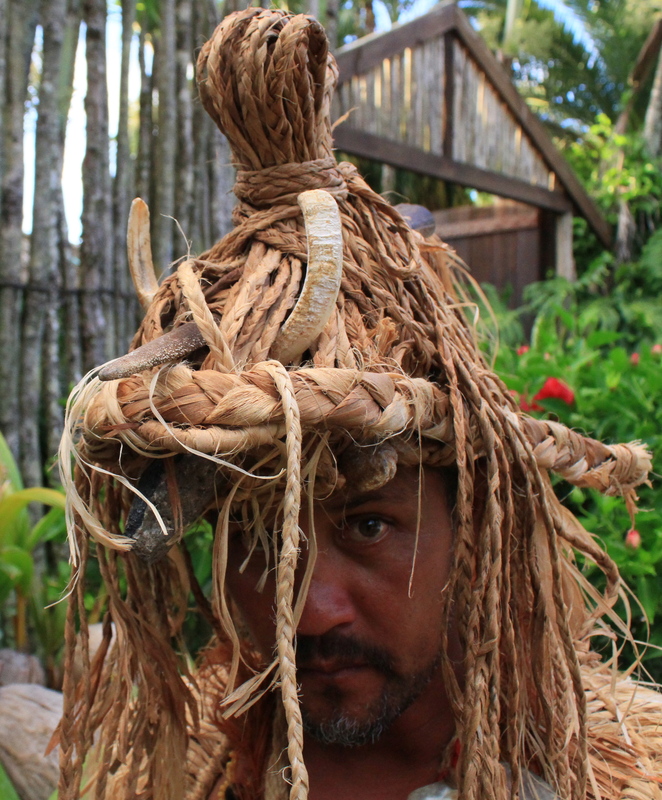 6727, 8 — A traditional performer at Highland Paradise in the mountains high above Rarotonga wears a warrior helmet decorated with the saw-nose of a marlin and the tusks of a wild boar. (photos 6789, 6822, 6831) The traditional dance and drum performance at Highland Paradise re-enacts many stories from Maori history, from the time of cannibalism to the arrival of missionaries and the modern age of tourism. 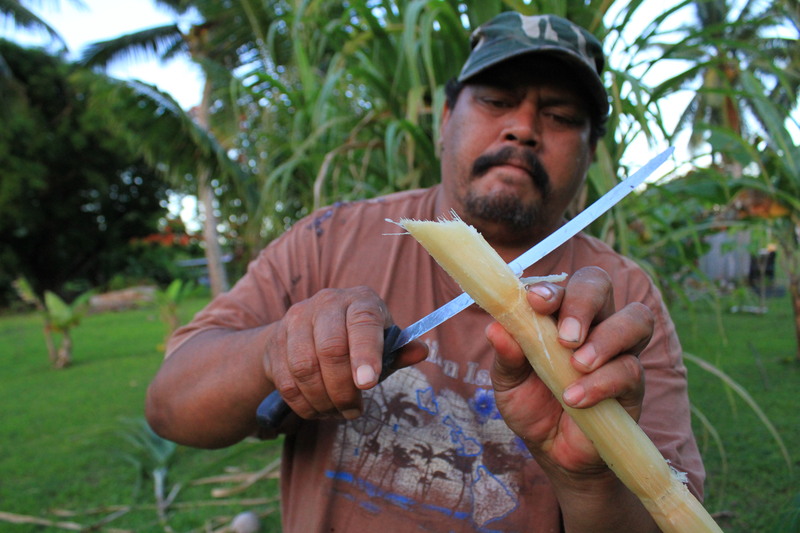 3370 — Ieyeta Nicholas, an architect and worker in the ministry of culture, cuts raw sugar cane from his garden for a tourist. 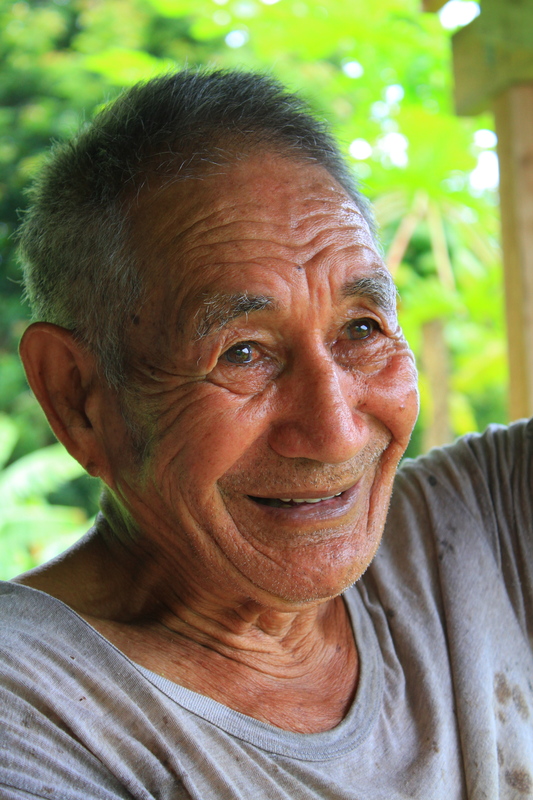 Like many Cook Islanders, he spent much of his life studying and working in Australia before returning, with his savings, to his family’s inherited land on Rarotonga. 3662, 3647, 3670 — While the tourism industry, the main driving force of the economy, has largely boomed in the Cook Islands over the past decade, a massive Sheraton resort went bankrupt and lies incomplete on the west side of Rarotonga, where pigs graze in fields originally meant for tourists on vacation. 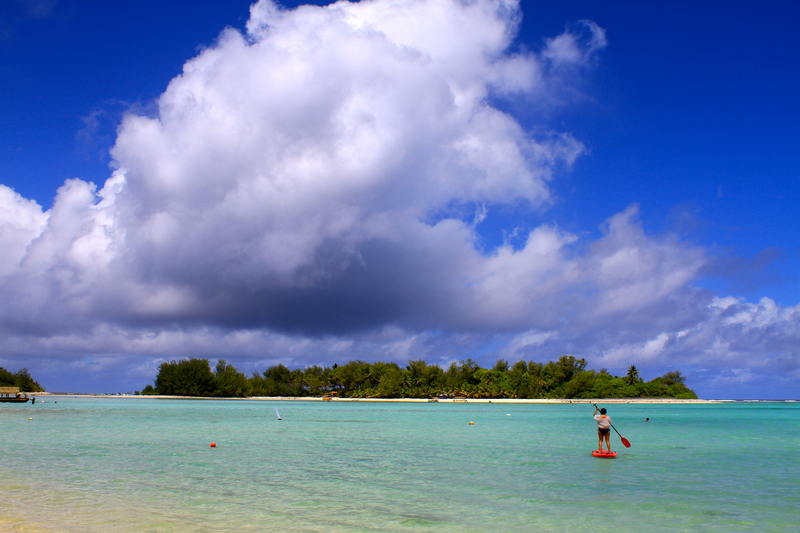 3766, 8 — The lagoon on Rarotonga used to teem with fish, children and fishermen. But an outbreak of ciguatera, which some scientists link to Global Warming, has scared away locals afraid of eating fish which has made hundreds ill in the Cook Islands. 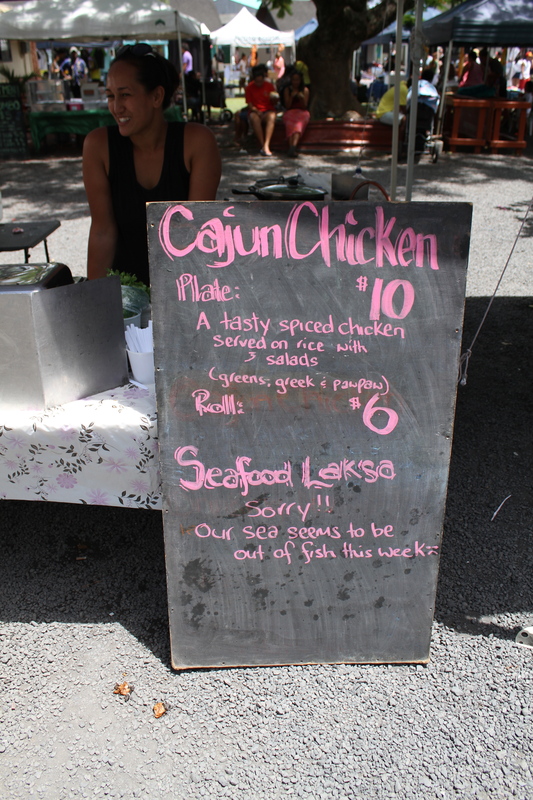 4323 — Due to the scarcity of healthy fresh fish, a local woman sells Cajun Chicken in the popular Saturday morning market in Rarotonga, Cook Islands. 4544 — Though not as world famous as Bora Bora, the main island of Rarotonga features majestic peaks atop a volcano stretching all the way to the ocean floor, 4500 meters below. 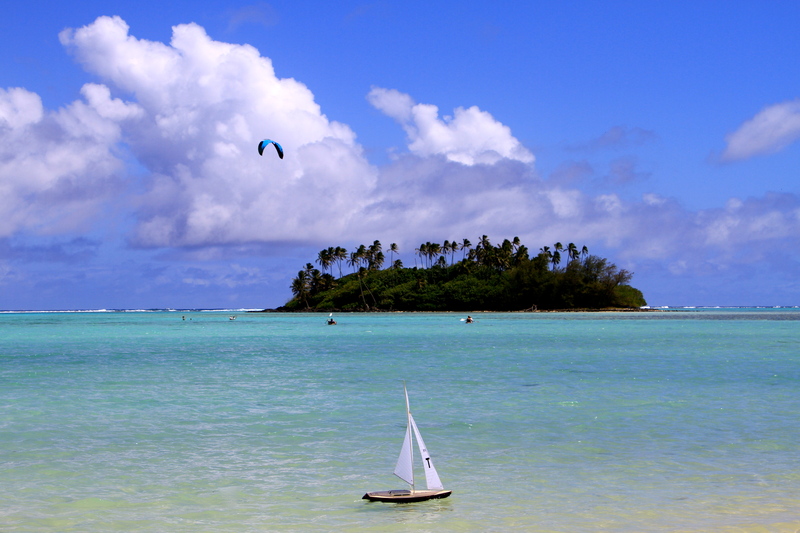 Living on Rarotonga is much like being atop Mount Fuji, if it was submerged in the ocean. 4790, 4778 — Young dancers wearing colorful costumes and bras made out of coconut shells perform at Muri Beach Resort on Rarotonga, Cook Islands. 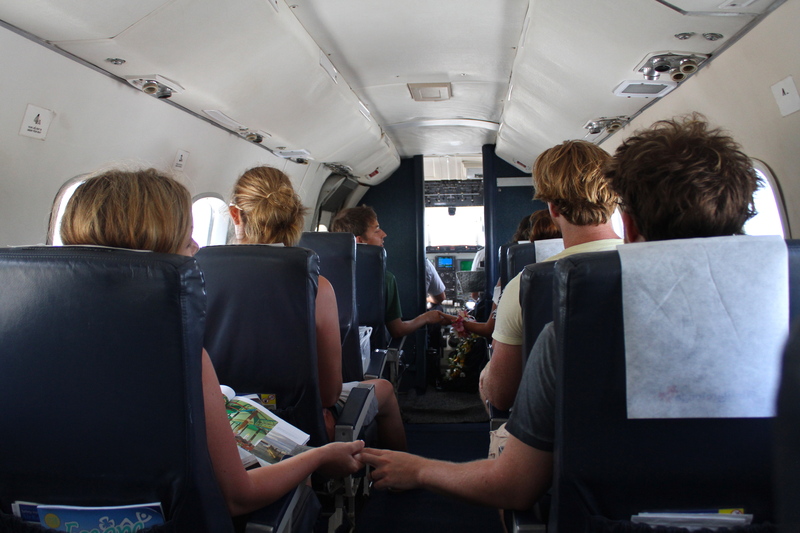 4970 — Young couples fly on a tiny Air Rarotonga jet for Aitutaki atoll, a popular honeymoon destination which the government hopes to increasingly market to Japanese couples. 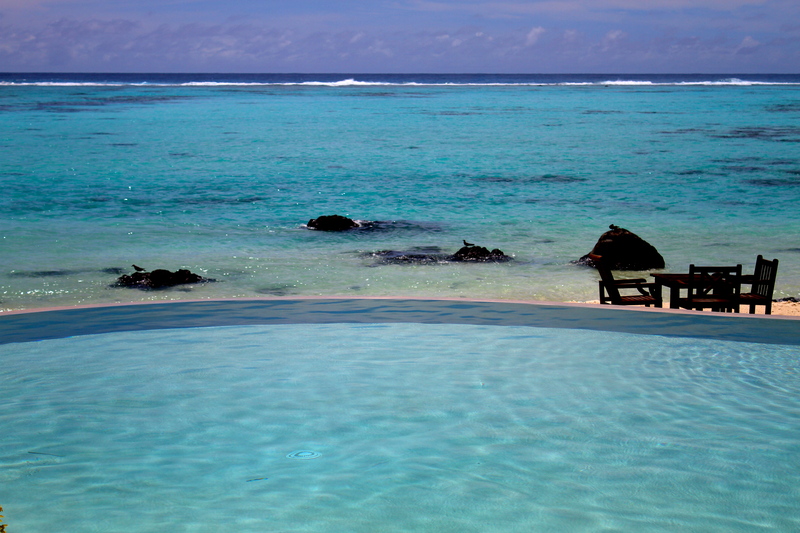 5295, 5334, 5335, 5719, 5768, 5742 Known as one of the finest properties in the South Pacific, the Pacific Resort on Aitutaki hopes to attract more Japanese tourists to its infinity pool, leafy beaches and legendary sunsets, best experienced by kayak on the glassy lagoon. 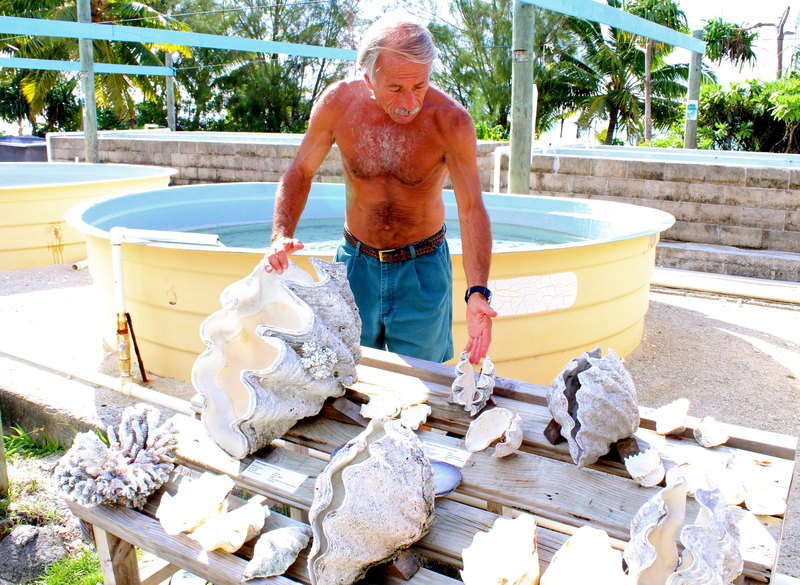 5375, 77 –US-born born marine biologist Charley Waters shows how he is growing clams in tanks at a marine research station on Aitutaki atoll in the Cook Islands. Amid a depletion of giant clams, which are a popular banquet food in the Cook Islands, he hopes to re-introduce the clams to the reef (photo 5672) in front of the Pacific Resort on Aitutaki and cover them in cages to protect them from currents, predators and poachers. 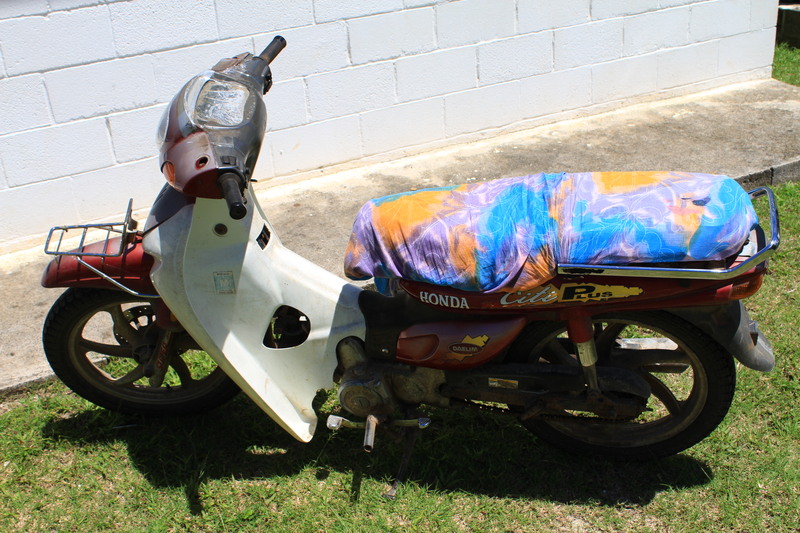 5908 — Honda motorcycles are everywhere on Earth, even in the South Pacific, where they are often seen covered with colorful materials. 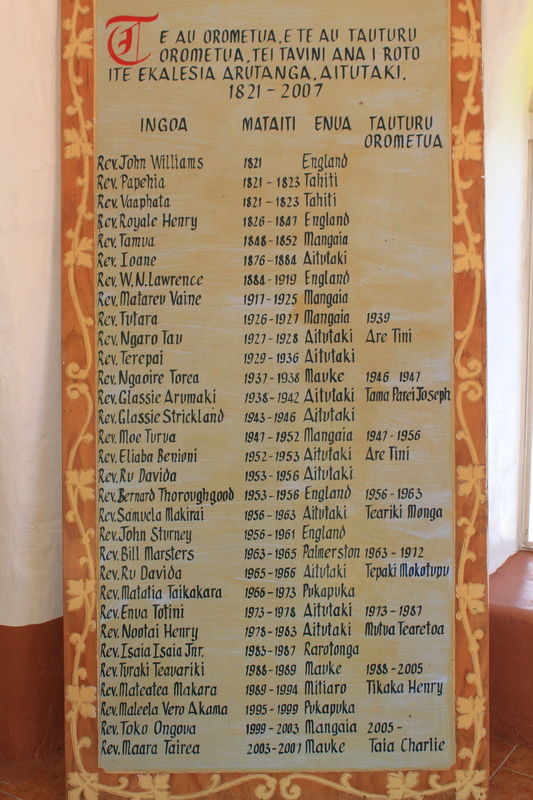 5903, 5905 — A scroll at an Aitutaki church, the oldest church in the Cook Islands, lists church leaders dating back to 1821, when English missionary John Williams and Papehia from Tahiti succeeded in converting the first locals to Christianity. 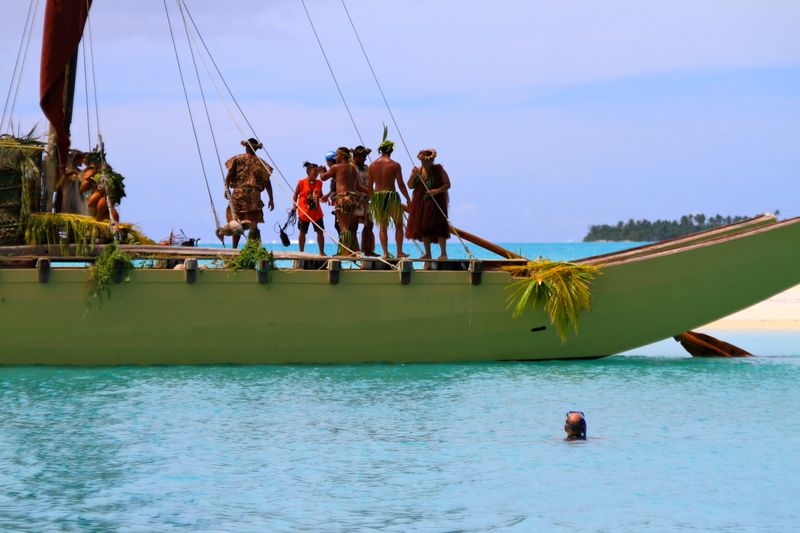 Many Cook Islanders bear the names of the early missionaries such as Henry, Marsters and Strickland. 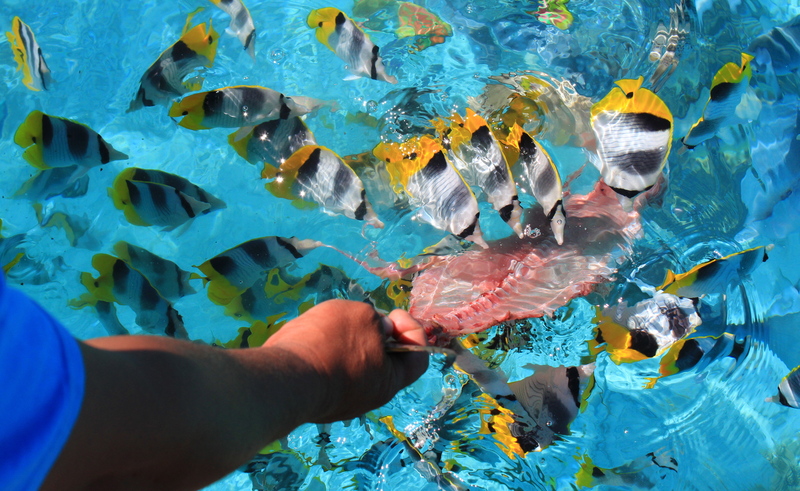 6107 — A guide with Teking Cruises feeds a school of colorful butterfly fish in a remote part of the Aitutaki lagoon. 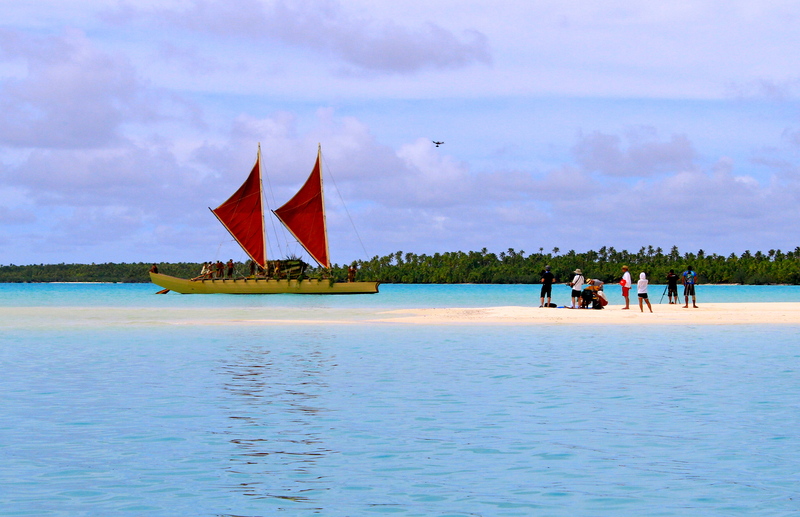 Many locals say they’re worried about the lack of fish, which used to be abundant in the lagoons of the Cook Islands. 6202, 6 — A guide with Teking cruises on Aitutaki atoll in the Cook Islands grills tuna steaks for snorkelers from Slovenia. 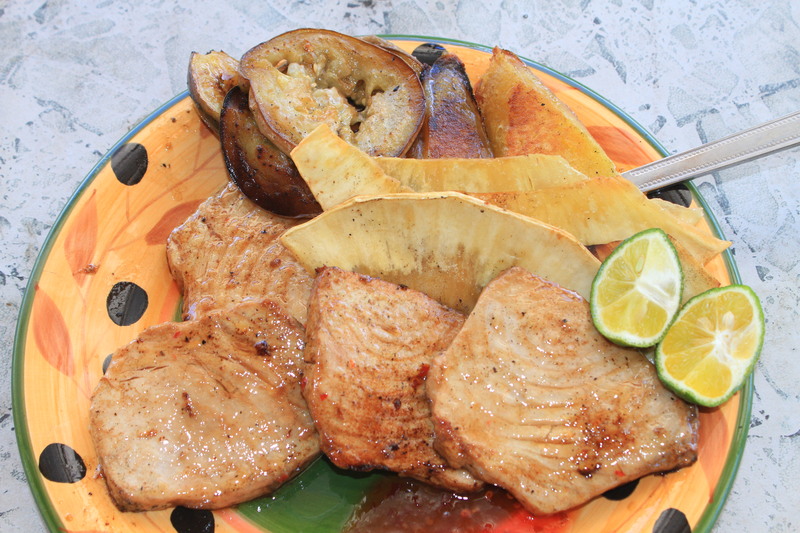 Since many locals are afraid of ciguatera poisoning from reef fish, tuna, which is caught in the safer waters of the deep ocean, is by far the most popular fish eaten in the Cook Islands, and ika mata (raw tuna) in coconut cream is a local delicacy. 6590 — Locals and tourists have become increasingly dependent on small take-away shops selling hamburgers and french fries, and also fish and chips based on frozen imported fish fillets from New Zealand, rather than seafood which surrounds them in the lagoons and Pacific Ocean. 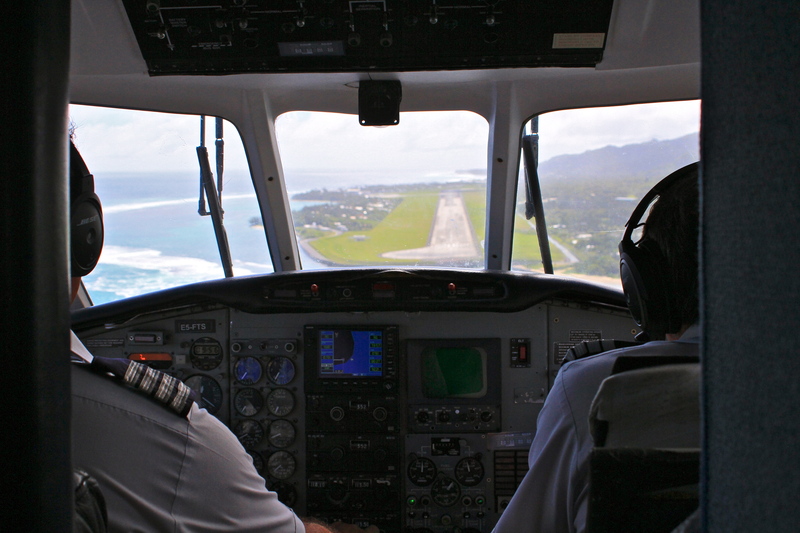 6632, 5 — Pilots of Air Rarotonga prepare to land on the narrow strip on Rarotonga after a 45-minute flight from Aitutaki with 8 passengers. The airline’s managing director, Ewan Smith, is also the author of the island’s best collection of photos. Since cargo ships are often delayed or grounded due to accidents or bad weather, most locals and tourists prefer to fly around an archipelago of 15 islands covering a surface area the size of western Europe. 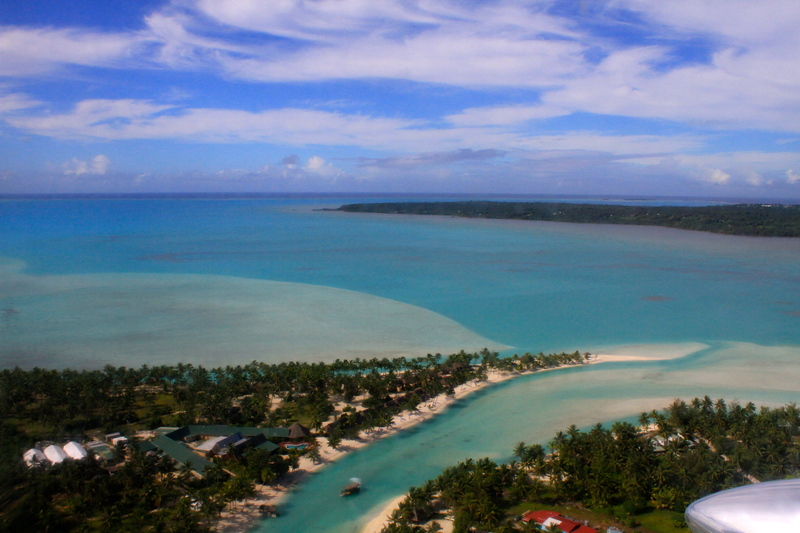 6596, 6606 — Known for its turquoise waters and warm hospitality, Aitutaki atoll, a 45-minute flight from Rarotonga, is becoming increasingly regarded as perhaps the most beautiful island in the South Pacific. 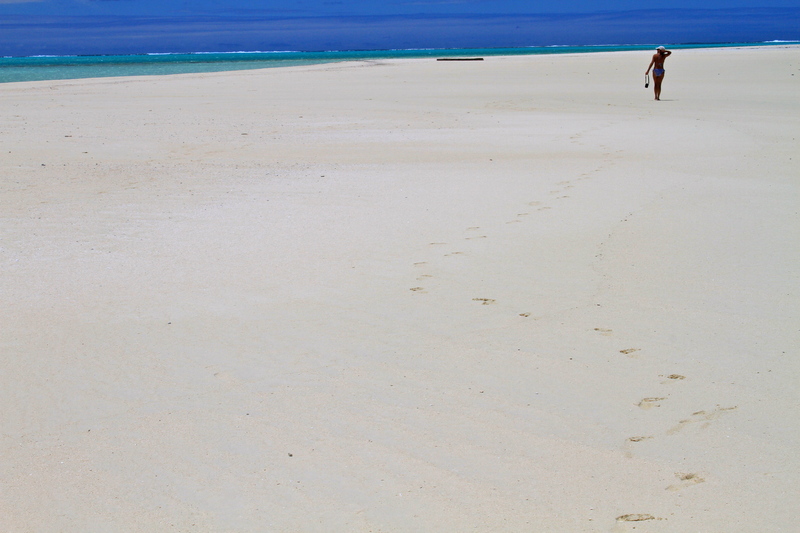 Tourists joining local operators such as Teking Cruises can enjoy long white sand beaches on uninhabited islets known as motus.